Plan Ahead for PRG’s Winning Patents Workshop! Radisson Hotel Newport Beach (left) and PRG Alexandria Training Center (right). Learn prudent practices for preparing and prosecuting applications that maximize the value of patents obtained for their clients. Develop an understanding of current Federal Circuit case law, which can result in claims being either unduly narrowly interpreted, and therefore held to be not infringed, or held to be invalid for lack of written description or enablement support. Appreciate what ought to be said – and not said – in the specifications, claims, and responses to Office actions, and why. Compose and prosecute a patent application in their chosen technology (chemical, mechanical/electrical, or biotechnology), based on a disclosure, prior art, and Office actions carefully created by PRG. Instructors: Paul Gardner, Beverly Lyman, and John Tsavaris. Course Times: 9:00 a.m. to 5:00 p.m.
For more information and to register online, by fax, or by mail, visit this page on the PRG website. 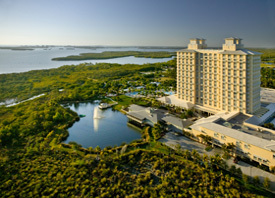 PRG’s Spring 2012 Advanced Courses Program will be held from March 25-31, 2012 at the Hyatt Regency Coconut Point Resort & Spa in Bonita Springs, Florida, and all courses have been updated to reflect the many impacts of AIA. We’ve posted an overview of all Spring 2012 Advanced Courses and looked at a variety of courses: “Designing Around Valid U.S. Patents” , Art and Science of Patent Searching, Crafting and Drafting Winning Patents, and Chemical Patent Practice. Our course highlighted today focuses on the intricacies of the Patent Cooperation Treaty: Comprehensive PCT Practice – How to Master Its Challenges. Landon IP, in conjunction with partner Patent Resources Group (PRG), is excited to present a training course specifically targeting patent professionals who need to better understand how to perform patent searches. Art & Science of Patent Searching — Patentability, Validity & Infringement is taught by Jonathan Skovholt and Brian Thurmond, expert patent professionals from Landon IP’s Patent Search Group, who provide strategic guidance to legal and corporate customers worldwide. Landon IP is the largest domestic patent search company and wrote the book on patent searching — Patent Searching: Tools & Techniques. Updated strategies from this text form the basis for this course. This course is appropriate for both those who conduct patent searches and those who commission them. It is designed for patent attorneys and agents, inventors, paralegals, and research managers and will be understood by anyone from the inexperienced to advanced practitioners. We’re offering Art & Science of Patent Searching on March 25-27, 2012 as part of PRG’s Spring 2012 Advanced Courses program at the Hyatt Regency Coconut Point Resort and Spa in Bonita Springs, Florida. The final half-day of the three-day course is an optional, hands-on Patent Searching Workshop, where attendees have a chance to practice searching alongside the course instructor. For more information on this course, see Spring 2012 Course Highlight: Art and Science of Patent Searching. PRG Patent Bar Review Course – Learn more about the PRG Patent Bar Review Course, which helped Chris gain the knowledge and strategies he utilized to pass the Patent Bar Exam. You can take the PRG Patent Bar Review Course in a live setting or through an online video course. Also learn about ExamWare™, one of the main study tools that Chris utilized after attending the PRG Patent Bar Review. USPTO website: Office of Enrollment and Discipline – Here you can find any news about the Patent Bar Exam (including updates based on the America Invents Act), a roster search for a patent attorney or agent, Exam Resources (including registration instructions, various fees, past Exams, and Exam result statistics), and a variety of other news, rules, and resources for registered attorneys and agents. See the rest of the links over at Passing the Patent Bar with PRG! PRG’s Spring 2012 Advanced Courses Program will be held from March 25-31, 2012 at the Hyatt Regency Coconut Point Resort & Spa in Bonita Springs, Florida, and all courses have been updated to reflect the many impacts of AIA. We’ve posted an overview of all Spring 2012 Advanced Courses and looked at a variety of courses: “Designing Around Valid U.S. Patents” , Art and Science of Patent Searching, and Crafting and Drafting Winning Patents. Now let’s look at a specialized course for chemical patent practitioners: Chemical Patent Practice. PRG’s Advanced Courses provide the perfect opportunity for you to get the professional training you need and to keep current with the latest developments in patent law. All our returning courses are updated every year to reflect the impact of relevant case law and other developments at the USPTO and the courts. For our Spring 2012 program (March 25-31), these updates include any changes needed to reflect the impact of the America Invents Act (AIA). We’re also offering a special one-day course, focusing entirely on the AIA, that every practitioner needs to take. Special Tuition Offer: Standard tuition for the one-day AIA course is $995, but get a special rate of only $495 if you also sign up for a three-day course at this program! The AIA course is conveniently scheduled between the two three-day sessions, to make it as easy as possible for everyone to attend. So join us in Bonita Springs, FL on March 25-31, 2012 at the Hyatt Regency Coconut Point Resort and Spa. PRG’s Spring 2012 Advanced Courses Program will be held from March 25-31, 2012 at the Hyatt Regency Coconut Point Resort & Spa in Bonita Springs, Florida, and all courses have been updated to reflect the many impacts of AIA. We’ve posted an overview of all Spring 2012 Advanced Courses and looked at the courses “Designing Around Valid U.S. Patents” and the Art and Science of Patent Searching. Today’s course highlight is for experienced patent professional who want to learn the art of Crafting & Drafting Winning Patents!